As the hype grows, I’ve been thinking about the solar eclipse today. 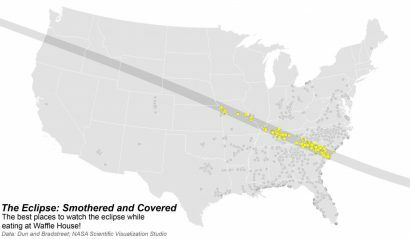 Thanks to Waffle House, I found this handy map (see right) in case you want your eclipse viewing “Smothered & Covered”. I heard on the radio that Krispy Kreme was planning competing events. Chocolate Glaze! Unfortunately, Indiana will be mostly bypassed for the total eclipse. We’ll only get a side view, but that’s still something like 85% coverage.. That should still be cool and weather permitting, I’m sure I’ll step out side to check it out. My friends around Atlanta are planning parties and events. Any excuse for a party and a day off work, right? The University of Georgia is planning a party in Sanford Stadium. (Article here) Do you tailgate for an eclipse? Knowing the Bulldogs (and I’m a UGA graduate, so I know of what I speak), the answer to that will be a resounding YES, Y’ALL! One of the other interesting tie-ins I saw was with the Nest thermostats. I chose to install one in my home. So far I’ve been pleased. More than similar devices, I have observed Nest really trying to make the green connection and not just personal energy cost savings. They send out a report on how many “leafs” you earn each month for energy savings along with a comparison to other Nest owners. There is a running total on their website showing their estimate of how many Kwh of energy that has been saved by their devices. Maybe I’ll see you out in the semi-darkness today. I didn’t accept the invitation to go to Atlanta and get the full effect… <sigh> Looks like it’s going to be rainy/cloudy there anyway. While I doubt this will be any kind of life changing event, it is one of those cool and rare physical phenomenons of which we should all take advantage. Hopefully for most of us it’s not literally a once-in-a-lifetime event, but it is pretty rare… And unlike most astronomical events, you don’t have to get up in the middle of the night to see it! Bonus! This entry was posted in Events, Humor, Personal by admin. Bookmark the permalink.